Back in the 80s I bought an Olympus OM10 as an upgrade from my father's Kodak Retinette 1A rangefinder. I was preparing for a High School photography class at the time. I ended up eventually getting a Pentax SF10 towards the end of the course, which was one of the first autofocus cameras out on the market after Minolta first blazed that trail. I used that camera on and off for a few years afterwards, but it soon gathered dust in storage. Then around 10 years ago, I ended up giving the complete system to an Education Assistant as she wanted to learn photography. I had immediate gifters remorse as that OM10 and I had some history together. Roll to recently when I got re-acquainted with my old friend at the local Value Village. It didn't have the rest of the outfit which was an assortment of oddball off-brand lenses inside a nice camera bag...but when I looked over it closely, it had my secret mark I had placed on the bottom of the camera ages ago. 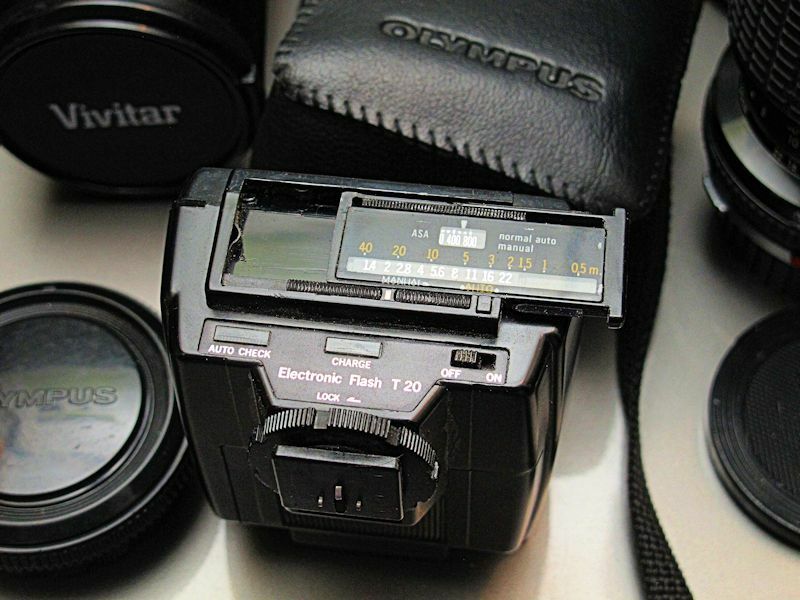 Now here is the funny thing, Back in the 80s I used to drool over the Olympus single digit cameras which were their professional lineup. I had always wanted one, but never could afford one. As it was, my Dad and I had to save for quite a while to get that Pentax SF10. Even with that, I had always wanted one of the higher up Olympus SLR cameras. Well I found one today, and it was quite by chance. I had walked into the local pawn shop and always gravitate to the camera display case. 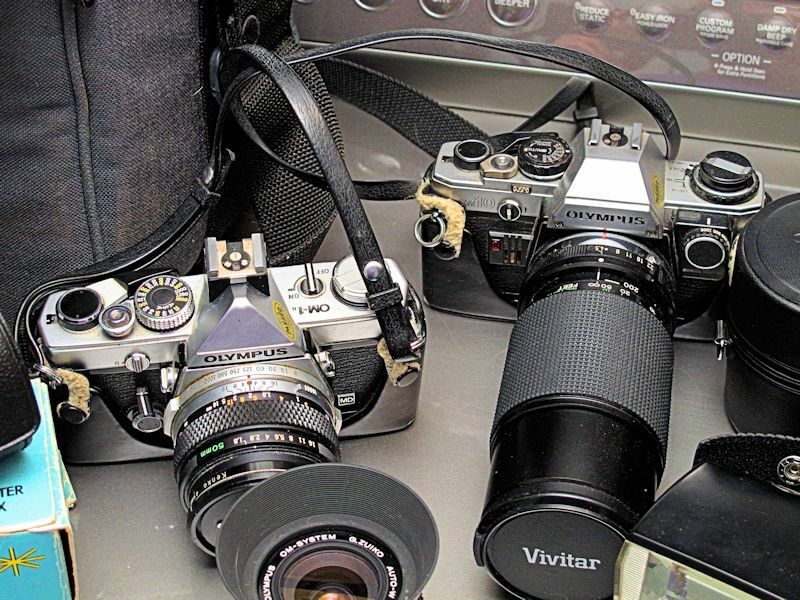 I spied a few interesting camera bags and had asked to see them. 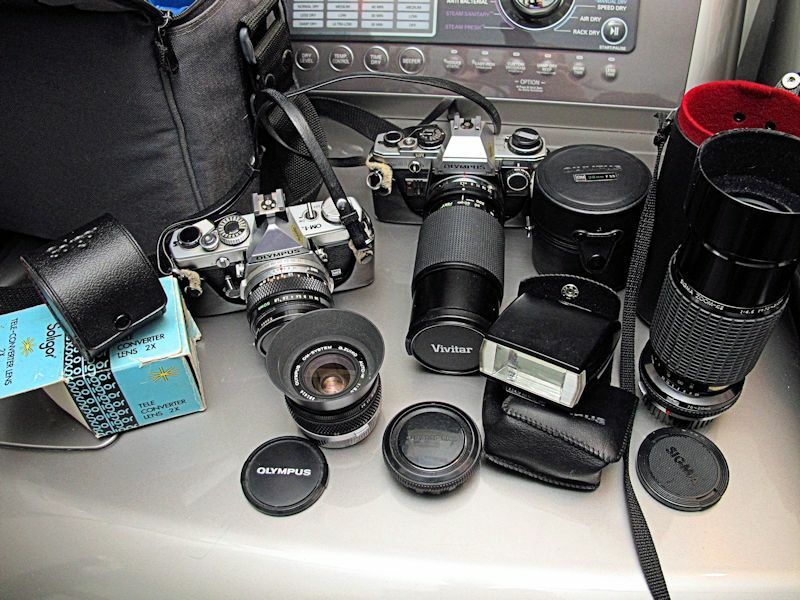 After going through several not so great bags, I spied an old Olympus 35mm SLR with an assortment of not bad lenses. They had wanted 100 dollars for it. At the time, I had assumed it was an Olympus OM10 and didn't much look at it. I was prepared to walk away when the employee told me it was 50% off. True enough, I then saw the sale sign. I left. Later that day, I had a little bug telling me that I should go look at that camera again. I cajoled myself that I could get a few more lenses for my OM10 camera for cheap. I battled with myself and lost after an hour of thinking. When I got back to the shop, the camera bag was still inside. I told the same guy I wanted to buy the Olympus film camera bag. I knew there were at least 2 lenses. I figured for 50 dollars, I couldn't go wrong even if the camera proves to be junk. Heck, I figured even one lens might be worth 50 dollars to me. Well, when I got it home, I was astounded that I had bought an Olympus OM 1n. I prayed that the camera was functional, and got excited quick. I started to examine the camera in greater detail, and to start testing features to see if everything seemed functional. I was immediately disappointed in that I couldn't focus the camera. I took a look at the lenses and was quite happy with the haul. On the camera was a Zuiko 50mm f1.8...the only Olympus lens I had with the OM10 back in the day. Included with that lens was a Zuiko 28mm f3.5 with lens shade, and a nice Sigma 80-200mm K2 f4.5 zoom lens. Ok, the lenses alone was worth the 50 bucks...but that was a single digit series Olympus camera. I went back to the camera and started to see if the issue was with the 50mm lens...although I thought it was very odd about what I was seeing in the viewfinder. I tried all the lenses with the same issue. Ok,that cleared the issue being with the lenses..but what else could it be? I then went online to find out possible issues. I soon realized that the focusing screen is interchangeable. I thought that maybe it was a bum focusing screen...but then I couldn't see the microprisms around the center focusing aid...everything was blacked out. Furthermore, the lenses I tried couldn't focus properly using the background matte surface either. Weird. Hmmm...maybe I should hit the manual? After reading the instructions from cover to cover, did I realize the OM 1n has a mirror lock up lever. I checked the camera and true enough, it was locked up out of the way. unlocking the mirror lock up brought everything back into perspective. That fixed the issue. During my testing, I also found a hot-shoe flash adapter and an Olympus T20 external flash. It took a few shoots before I could get the flash to work properly. I had failed to fully screw in the retaining knurl, probably not making contact with the electronics on the camera the first time. I hadn't counted on finding a real Olympus OM flash in the kit...that was a nice bonus. It sure beats my old Vivitar third party OM compatible manual flash. So now I have a nice little nostalgic Olympus OM film kit going on the cheap. Heck, I even managed to scratch a piece of photographic history from my bucket list. Here is a photo showing the whole kit. Included are my old OM10 with manual adapter installed and Vivtar 80-200 mm f4.5 push pull zoom lens. On the left of the OM10 is the OM 1n with Zuiko 50 mm f1.8 lens. Included was a Zuiko 28mm f3.5 with lens shade, a Sigma K-2 f4.5 push pull zoom with included lens shade, Olympus T20 dedicated flash, and a Soligor 2X converter for Miranda lenses. A closer look at both cameras. A look at the back of the Olympus T20 flash. It took me a little time to figure out that I needed to press that little square button and at the same time, slide that bar to the right. This allowed me to remove the back piece which turned out to be a manual scale for those times when automatic mode is not required, or available. I thought that was a bit of interesting design. Re: Another awesome pawnshop find. I had that Vivitar lens back in the day, albeit in Canon FD mount. Can't remember if it was good or not after all these years. Enjoy the use, I only wish film was as cheap now as it was back then. I hear you. I used to buy B&W film in bulk and process it in my basement darkroom. That stuff is long gone.